One of our most popular pastry courses. Master the heartiest savoury baking, with a lesson in pies, pastry and suet pudding at the River Cottage Cookery School. 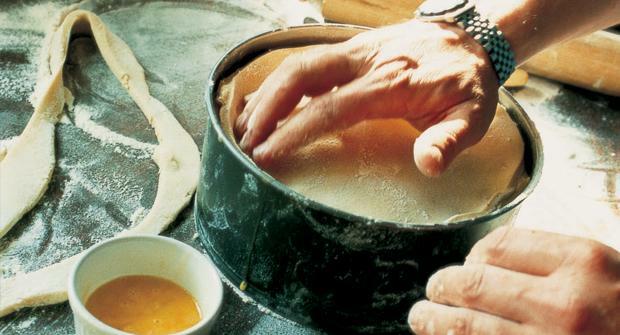 Our day of hands-on learning in the beautiful Devon countryside will make baking as easy as pie, giving you the skills to make a variety of savoury pastry recipes – including shortcrust, rough puff, hot water crust and suet. With expert tuition from the River Cottage chefs, you’ll bake up comforting classics such as sausage rolls, pork pies, steamed puddings, Scotch eggs, tarts and quiches. As with all of our pastry courses you won't leave hungry, enjoying some of your efforts for supper and taking the rest away to feed friends and family at home. You’ll start by making shortcrust pastry, which will rest in the fridge until later in the day. Master the art of making light and flaky rough puff pastry, ready for baking later. You’ll create a steamed pudding using organic ingredients from local producers and our very own Kitchen Garden. Our chefs will demonstrate how to make the very best pork pie, using traditional hot water crust pastry. You’ll use your rough puff pastry to make chorizo sausage rolls for lunch. Next you’ll learn how to turn your rested shortcrust pastry into a fantastic savoury tart or quiche. You’ll prepare your starter, a delicious Scotch egg complete with perfectly runny yolk. After all your hard work, you’ll sit down to enjoy a hearty supper of the food you have prepared. There will be time to chat to your fellow scholars and the River Cottage team, before being whisked back up the hill by our tractor and trailer (at 5pm) – with your handiwork to take home! We would also advise that this course is only really suitable for 12 years of age and upwards. Under 16s must be accompanied by an adult. We put these guidelines in place for the safety, comfort and enjoyment of all our guests. We put these guidelines in place for the safety, comfort and enjoyment of all our guests. Sorry, we’re afraid this course is not suitable for vegetarians or those with coeliac disease or wheat intolerances. However we do run Gluten Free Cookery courses and courses suitable for vegetarians.